The first day of admissions at Delhi University started on a slow note across campuses. With this being the first year of DU undergraduate admissions going online, there was some understandable confusion about the procedure to be followed post the release of the first cut-off list. Unlike previous years when the entire process had to be done at the colleges, from the forms to the final applications, this year the aspirants were required to first log on to the UG admissions portal and generate the college specific form, based on whichever college/course they were eligible for. The only on-grounds element was the verification of the documents. A few unaware aspirants and their hassled parents were seen on college campuses in the morning, being informed about the procedure by college volunteers. The chaos was compounded by the DU UG portal which was, as informed by several concerned aspirants, non-functional. “DU needs to take care of the technical aspects of such a large-scale admission process. 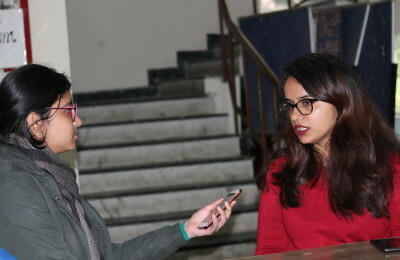 When they announce something on the university website, we expect them to abide by it,” said a hassled outstation aspirant to our journalist in Lady Shri Ram College for Women. Not being able to generate the form online and confused about the procedure, the number of aspirants at colleges was definitely lower than expected, especially for certain South Campus colleges like Kamala Nehru College.